. 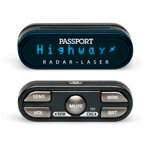 - Passport 9500ci The PASSPORT 9500ci is the ultimate custom-installed radar and laser defense system. With blistering all-band radar protection and precise laser shifting technology speeding tickets can be a thing of the past.